A court in central Vietnam Wednesday sentenced a man to 12 years in prison for trying to “overthrow” the government. Nguyen Trung Truc is seen in a file photo provided by Quang Binh police. 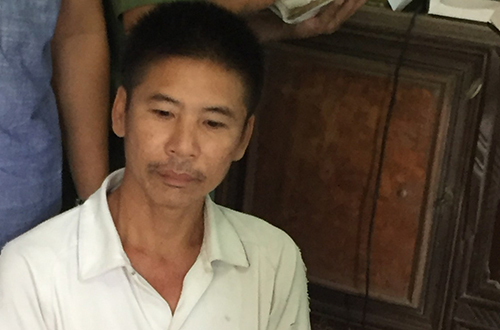 Nguyen Trung Truc, 44, had been charged with "carrying out activities aimed at overthrowing the people's administration" at a trial in Quang Binh Province. According to the verdict, Truc was one of the leaders in the central region of a seditious outlawed group called Brotherhood for Democracy, which carried out activities aimed at changing the leadership of the Communist Party and “building a multi-party system” in Vietnam. He was arrested in August last year and his jail time will be counted from then. The court also ordered law enforcement authorities to keep him under constant surveillance for five years after his release. Under Vietnam's Penal Code, "carrying out activities aimed at overthrowing the people's administration" is a crime carrying capital punishment for organizers, instigators and active participants and jail terms of up to 15 years for accomplices. In a similar case last April a Hanoi court sentenced six members of the to nine to 15 years in prison. Also in April a court in the north-central Nghe An Province sentenced , 53, to 20 years in prison and five years of probation for similar crimes. He was an active member of Viet Tan, which Vietnam has designated a terrorist group.